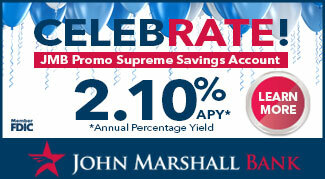 Get 2.10% APY on account balances of $5,000.00 up to $1,000,000.00. Account balances below $5,000.00 and above $1,000,000.00 will earn 0.20% APY. After 14 statement cycles, the account will automatically change to the standard JMB Supreme Savings rate in effect at that time. Balances above $50,000.00 would earn 1.50% APY, while balances below $50,000.00 would earn 0.20% APY. The APY is subject to change at any time. A monthly service charge of $3.00 will be imposed if the average daily balance for the statement cycle falls below $100.00. Fees may reduce earnings. Effective February 4, 2019; New Money Only (money that has not been on deposit at John Marshall Bank for at least 30 days); Minimum of $5,000.00 is required to earn APY; Maximum of $1,000,000.00 per tax ID number; Not available for brokered deposits, public entities, or municipalities; John Marshall Bank reserves the right to modify or terminate this special offer at any time.